Unusual item in my luggage on my trip to Oxford. Vampire Slaying Kit (circa 1920). These kits were sold to capitalise on the popularity of Dracula as a form of entertainment but the contents point to darker, more unsettling undead issues. 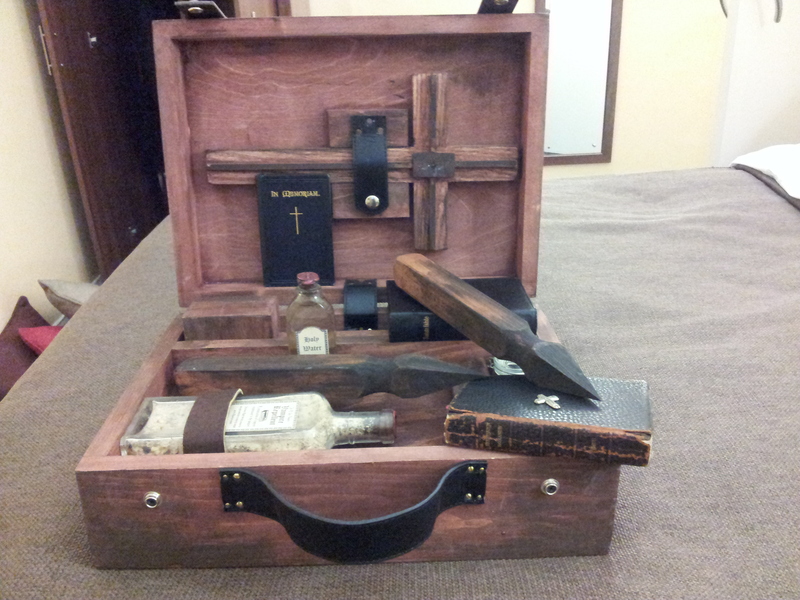 The box contains a crucifix, Bible, holy water, wooden stakes and a mallet together with the book of common prayer (1851 edition). Inside there is an unnerving handwritten passage from Luke 19.27 which reads: ‘but those mine enemies, which would not that I should reign over them, bring hither and slay them before me’. I’ll leave you with that thought!! Hope to bring this along to some of our events for you to see in person (we have a Gothic Writing Evening in St Albans on 7th November). It really is deeply curious, troubling and entertaining. Like to know your thoughts.. This entry was posted in OGOM News and tagged Dracula, Montague Summers, Vampires. Bookmark the permalink.